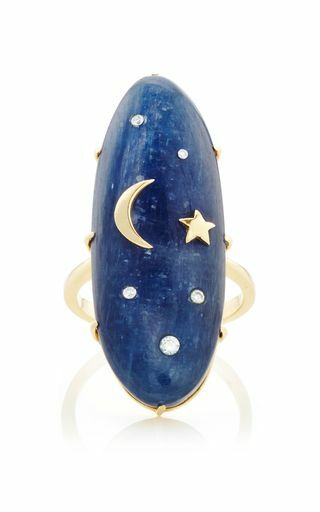 I’m a bit obsessed with anything celestial. 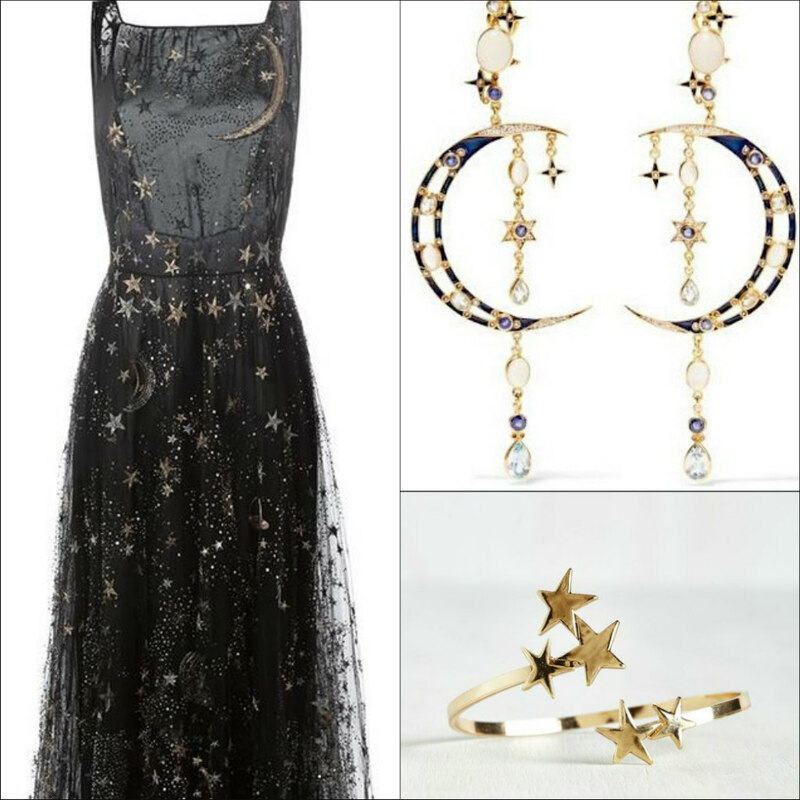 I find the combinations of stars, moons, midnight blue and gold mystical and enchanting. The shapes and color suggest adventure, the unknown, and are just alluring. So when I saw the Jenny Packham Wedding Gown Collection for 2017, I was completely taken by two celestial inspired gowns that suggest wanderlust and the Gypsy spirt, and could not resist adding the finishing details to these ethereal wedding gowns. Jolene by Jenny Packham style JPB645. Sparkling tulle overlay, gold star appliqués, sheer bodice and cap sleeves with sparkling beadwork. 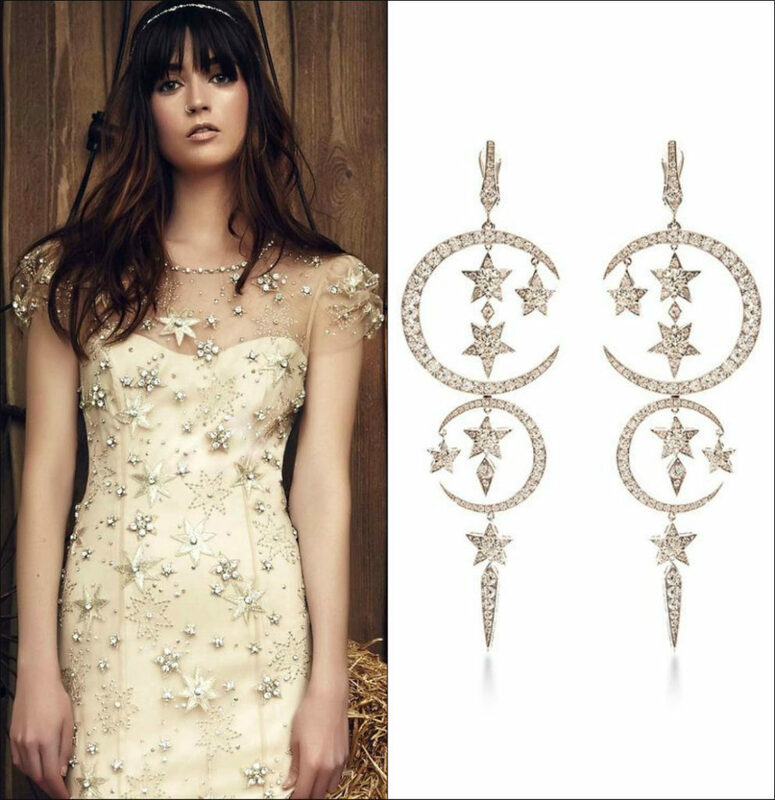 I couldn’t resist pairing these stunning mismatched danglers from Percossi Papi with the Jolene Wedding Gown. Love these Chandelier Earrings by Stephan Webster with the Lucky gown. Celestial gowns and accessories have always had a place in fashion and the most renown couture design houses. Here are some stunners in midnight blue going back to 1950 that are equally stunning today. 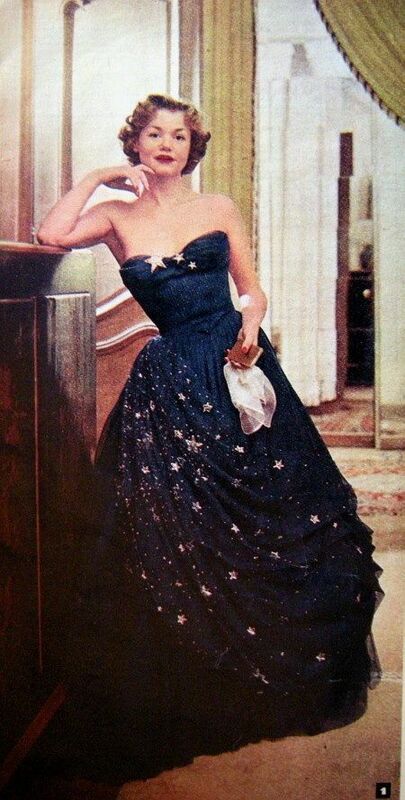 1950’s Balmain strapless gown in midnight with gold stars adorning the milky-way. A current celestial inspired midnight blue gown from the 2016 Belville-Sassoon collection with silver stars embellishments over a light and airy tulle. Total “Show Stopper”. 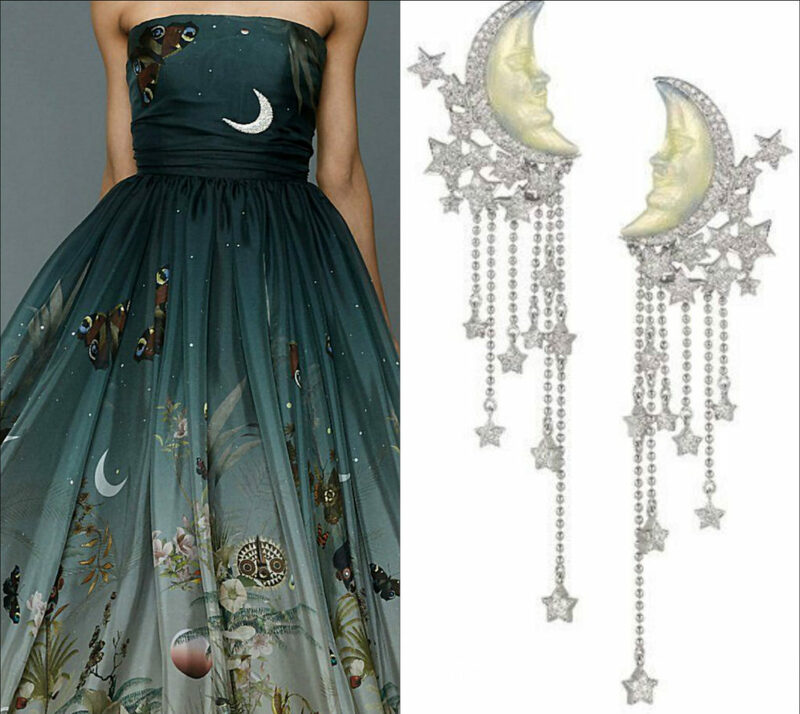 My heart skipped a beat when I saw how fabulous these Lydia Courteille moon faced earrings looked with this amazing celestial gown from the Dennis Basso Fall 2016 Collection. I can’t decide which is more amazing. 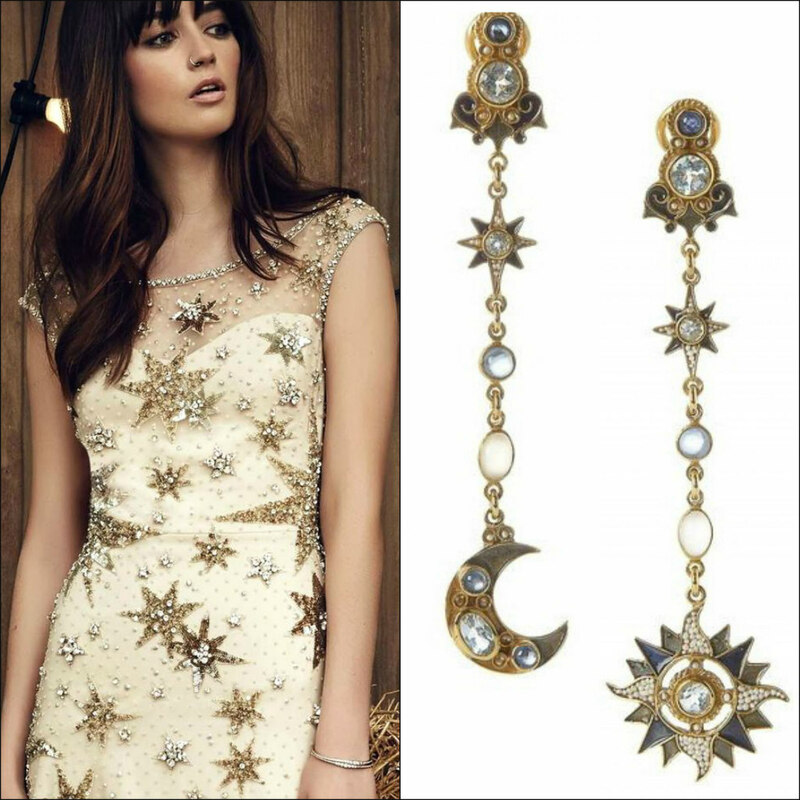 The midnight Valentino Gown covered in the entire solar system or these amazing moon and star chandelier earrings. Reuben Miller Hidalgo rings. 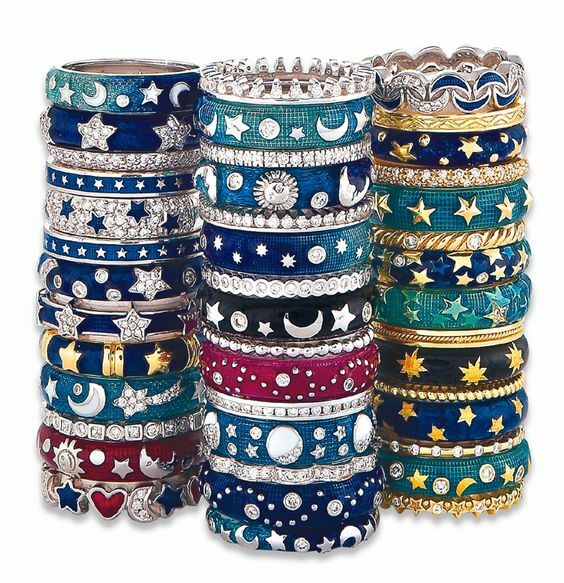 Fabulous colors and designs to stack or wear solo. Can you select just one? I drew my inspiration for this post from all the fabulous finds I have collected on pinterest. Find these gowns and many more on my gown board and these jewels and tons of breath taking sparkle on my vintage and fine jewelry board. WARNING: if you love sparkle and jewels I suggest blocking out an hour and pouring a glass of wine while you create your imaginary jewelry box. Of course you can see many of our Perfect Details products throughout many of our boards, as well as many of the styled photo shoots I have done and wedding gowns we have accessorized.